Since I started sewing more than 20 years ago, I've used a range of different sewing equipment, from mere hand-sewing needles, to a hand held mini chain-stitch machine, and to the venerable sewing machine. 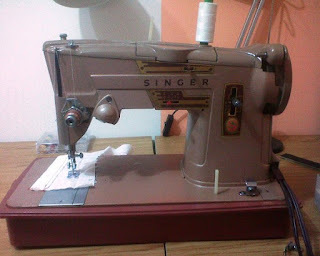 The first thing I've ever sewn on a sewing machine was a white apron for home-ec classes and the machine in question was my mother's old Singer treadle, set in its own cabinet, which required one's feet to be in sync with the rhythm of the treadle or else! At 13 years-old, rhythm was not something that came naturally to me and that apron, although wearable (used it for 2 years), was a sampler of wonky stitches and crooked lines. When my father finally fitted a motor to it, I was thrilled of course, but then had to overcome yet another obstacle - the speed! Since then, I've gotten much better and have moved on to newer models (always Singer), with even greater speeds. Ironically, nowadays, I'm quite nostalgic for that old treadle and often roam Ebay to feed that nostalgia. Sadly, exchange rates and postal charges bar me from actually purchasing one (with cabinet and all!). My machine of choice now is naturally also very retrospective. The Singer 328K ('K' to denote that it was made in Great Britain) is a cool, mocha coloured sprinter from the 1960's. Its art deco design and brass fittings are so demonstrative of the era of its conception. This is an all-metal geared super machine that runs like it knows no boundaries. I've pushed 4 layers of canvas through it, forced fed it plastic sheets and it never complained. Best of all, I can set it to sew backwards - indefinitely! No more holding down buttons with one hand while trying to align fabric with the other. I've never enjoyed sewing more since getting this little gem. Some might say talent has nothing to do with how good your gear is...but great is your motivation when you've got just the right tools! These machines are often available on Ebay, along with attachments and replacement parts. They've become quite sought after since I acquired mine and can fetch up to USD200 if the condition is good. I bet you recognized my banner! Those random shots you took around my studio came in useful after all, eh?! Hurrah, I just found this! Makes me wanna do a post on my sewing machines (always Pfaff). So loyal, we are. I must put you on my blogroll too! Good luck with all the posting. I can't wait to see what you've made! I have the same machine. I've never loved an object as much! And I agree, when I got this machine, my sewing ability definitely improved. It's smooth as silk. The best part: I got it in a thrift store for $10. Then bought the attachments on Ebay. There is also a service manual you can purchase on ebay. Krishna Engineering Works a manufacturer, exporter of different types of Winding Rewinding Machine. Also, Doctoring Film Strip Winding Rewinding, Winding Rewinding With and Without Slitting System, Coil Winding, Winding Unwinding. Winding Rewinding Machine for different types of applications and for different industries.